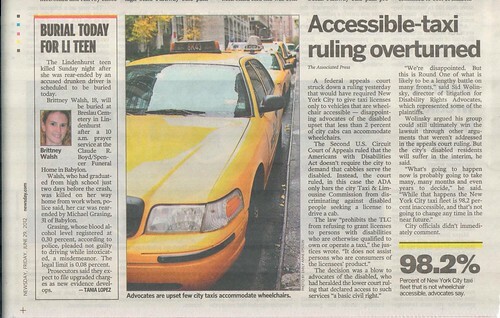 accessible taxis ruling, originally uploaded by Edu-Tourist. A very vocal group of disability activists (including several Disability Studies scholars) turned up for an early August party at New York Mayor Blumberg's Gracie Mansion residence in Manhattan. Barred from making their feelings known regarding the city leadership's tepid support for the Americans with Disabilities Act, the protesters gathered outside and blocked the street outside the mansion for their own form of "celebration." According to AP News, after the Second U.S. Circuit Court of Appeals ruled that the Americans with Disabilities Act did not require the city to demand that cab companies serve people with disabilities, Mayor Blumberg lent his own wholehearted support for the decision. Through strategic CNN iReport, Google+ and Facebook posts we learned that four of the protesters were arrested outside the August 9th ADA anniversary party. The sight of them being hauled away was itself ironically telling: since the police department did not not have any accessible paddy wagons. the four protesters had the loaded onto Access-A-Ride vans.